It seemed like every game a different player stepped up for the reigning representatives, the 5th-seeded ’99-’00 Blues. They took the opening game by a score of 4-2 with Pavol Demitra tallying two goals and an assist to lead them to the win. Then, in Game 2, it was goaltender Roman Turek who was the best player on the ice for the ’99-’00 Blues. He stopped 31 of 32 shots against to lead the reigning reps to a 3-1 win while Marty Reasoner led them offensively with a PP goal and an assist. 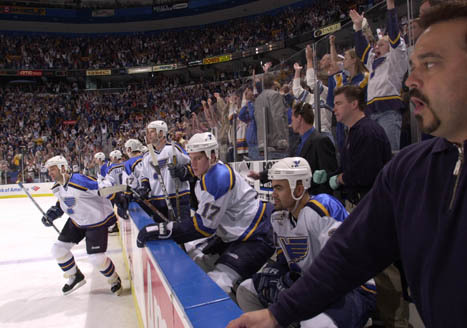 It was Pierre Turgeon‘s turn to lead the ’99-’00 Blues in Game 3 as he posted two goals an an assist, but Demitra and defensemen Chris Pronger and Al MacInnis all posted three points in the game as well. However, the 4th-seeded ’00-’01 Blues did have some pretty good performances in this game as Scott Young netted a hat trick while THEIR Pronger and Turgeon both notched two assists.The ’00-’01 Blues then took Game 4, their only win in the series, by a score of 6-1. Turgeon and Young both totaled four points with Turgeon tallying two goals and two assists while Young registered a goal and three assists. In Game 5, the ’00-’01 Blues tied the game at three thanks to a goal from Keith Tkachuk. However, Turgeon scored for the reigning reps with less than three minutes remaining before Demitra netted an empty-netter to seal the game and the series for the ’99-’00 Blues. Up next is the 2-7 matchup between the ’69-’70 Blues and the ’94-’95 Blues! This entry was posted in Qualifying Tournament, Ultimate NHL Playoff and tagged Al MacInnis, Chris Pronger, Keith Tkachuk, Marty Reasoner, Pavol Demitra, Pierre Turgeon, Qualifying Tournament, Roman Turek, Scott Young, St. Louis Blues, Ultimate NHL Playoff. Bookmark the permalink.